Healthy lunch ideas can overcome a major weight loss obstacle. Most people don't just abuse lunch. They plunder it. Significant research proves the fewer meals a person eats, the greater the likelyhood of obesity. My experience validates this research. It's true. Scientists speculate when you skip breakfast and lunch, your blood sugar becomes unstable causing cravings and hunger which leads to overeating. Worse, evidence exists that if you eat one large meal a day of 1,500 calories -- rather than several meals totaling the same amount of calories -- you are more prone to gaining weight. Eating large meals frequently, can interfere with metabolic efficiency, promotes high cholesterol and insulin resistance. A steady diet of large meals will sap your energy and make you feel like a lump. A prescription for weight gain. Smart lunch ideas include eating smaller, more frequent meals and snacks. Over time the smaller meals cause your stomach to shrink. Which should result in you feeling full and satisfied eating less. People who eat several meals a day are less prone to craving and gorge-fests. Skipping lunch is not effective for weight loss and usually results in more calories consumed rather than less. If time is a problem for you, I recommend the multiple options included in this section. It doesn't matter if you're a brown bagger or a fast food luncher. This list offers workable solutions for any hurried person wanting to transform lunch from weight gain liability to a weight loss asset. Low calorie foods are not necessarily diet food. Nor does all low calorie food taste like styrofoam. For instance, your basic McDonald's hamburger has only 250 calories. Which qualifies it as one of many low calorie sandwiches. Don't automatically rule out fast food when considering healthy lunch ideas. Low calorie fast food does exist. With a little background information and research, you can know exactly what you're ordering. Find real low calorie fast food solutions here. 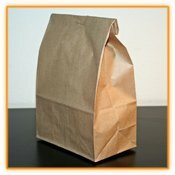 HEALTHY BROWN BAG LUNCH IDEAS. and leave HEALTHY LUNCH IDEAS.